7 - 4 interlaced dots (Idukku Pulli) Kolam - Start with 7 dots in the center and stop at 4 by putting interlaced dots at both sides. 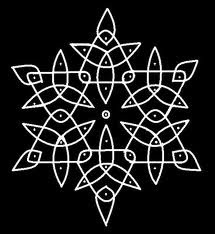 If you are drawing this kolam on cement/concrete floor, then you can use ground rice paste (Maa Kolam) and leave it as above. If it is on the sand, then you can fill it with desired colours. I have tried some of them here,my neighbors praised them...the credit goes to you..
the step order is really very helpful to beginners like me..